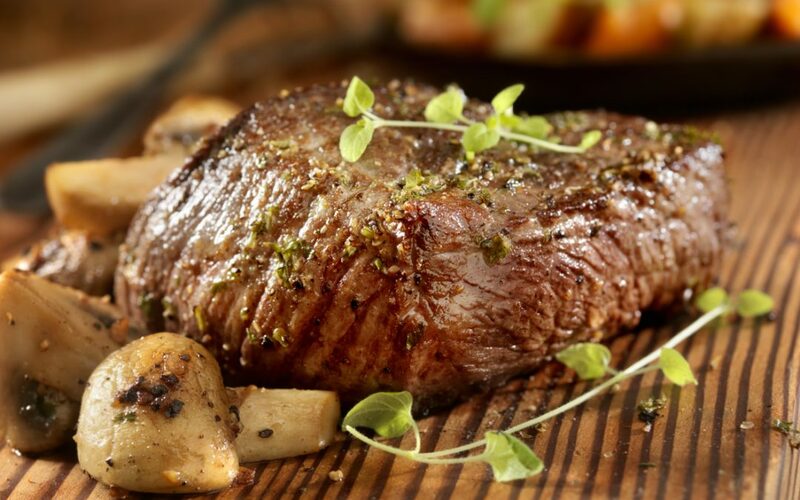 A thick, juicy, succulent steak dripping with flavor… Sounds good, doesn’t it? That’s what you can expect with one of our dry-aged, sirloin grass-fed steaks. All it takes is a little care in the preparation of this lean cut of beef to bring it to its flavorful best. Where on a cow is the sirloin? Sirloin steak comes from high on the cow’s back, just in front of the hip. It’s behind the loin and in front of the round. This beef chart shows all of the primal cuts and where they come from on the cow. There’s an old saying that the tenderest beef is the farthest from the hooves and horns but the best flavor is the closest to them. That’s because the areas around the neck, shoulders, and legs get the most exercise. We knew all of that walking and grazing in our green pastures was good for our cattle! The sirloin comes from the area between the aptly named (and little used) tenderloin and the well-muscled rump. Muscles like the rump that get plenty of exercise developing a rich, beefy flavor. This means that sirloin gets the best of both locations. It’s both reasonably tender and richly flavored. Sirloin by its nature is very lean and when it comes from our all natural, grass-fed beef it’s extra lean. Dry aging it for 30 days intensifies the flavor and tenderness but also shrinks the marbling. Now it’s really lean! Grass-fed steaks this lean require proper handling and cooking to keep them tender and juicy. We have two preferred methods for cooking a juicy, tender sirloin steak. The first involves using a meat tenderizer on it before giving it some quality time in a marinade. Choose one that has a mild flavor so it doesn’t mask that rich beefiness. The second method is a quick, screaming hot sear followed by cooking it over a gentler heat just until it’s rare to medium rare. Either way, let it rest for 10 minutes so the juices don’t all run out on the plate. Dig in and enjoy! While you’re thinking about steaks, why don’t you give our dry-aged T-bones a try? They’re 1 1/2 – 2″ thick morsels of juicy deliciousness! Better yet, order a steak variety bundle. It includes both sirloin and T-bone steaks, along with New York strip, sirloin tip, and tenderloin steaks. At Rafter W Ranch, we have the best meats you can buy. That’s because they’re raised with love and care on our family ranch rather than on steroids and GMO grains in a crowded feedlot. Taste them and savor the difference for yourself! Contact us to place your order today.